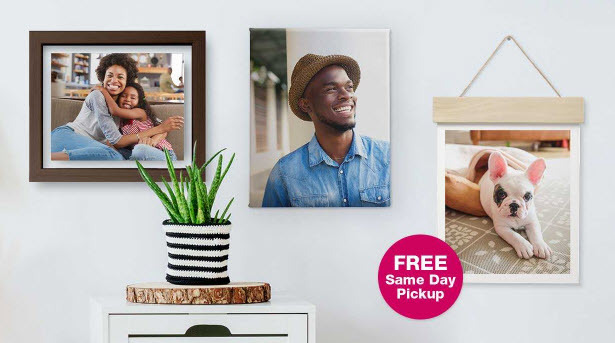 75% off EVERYTHING Photo for the wall! 75% off Everything for the Wall: Must use code LUCKYDAY75 to receive 75% off everything for the wall through Walgreens.com/photo online or mobile app. Offer not valid in store. Offer expires at 11:59 p.m CT on March 23, 2019. Offer discount is limited to products under Canvas Prints, Wood Panels, Wood Hanger Board Prints, Custom Floating Frames, Posters, Enlargements (excludes 4×6 & 4×5.3), Metal Panels, Banners, Board Prints, Designer Prints, Wall Calendar, Magnets only. Up to three coupons can be used in one cart if no overlapping products exist in the offers being applied.Void if transferred, reproduced or copied and where prohibited by law. Discount does not apply to previous purchases, taxes or shipping charges. Walgreens is not responsible for lost or stolen single use coupon codes or codes used without permission. Offer is subject to change or cancellation at any time.